Get on the boat, get on the banana boat… OK, yes that is a jingle for sunscreen, but hey, it works for today’s recipe. 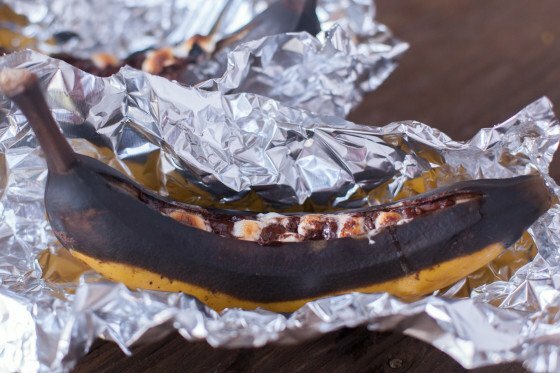 Warm melted chocolate, gooey marshmallow, and banana wrapped in its own skin. Campfire desserts are wonderful items and this recipe is easy to pack and carry. Slice each banana lengthwise just cutting through the outer skin and the banana but not all the way through the other side. Leave the skin on (do not peel). Put 1-2 tsp. of the marshmallows and chocolate chips in slit. Sprinkle over the filling lightly with brown sugar. Wrap tightly in foil, being sure to seal ends. Place on grill over campfire or coals, seam side up. Takes about 7 minutes to cook. Sweet, satisfying, and fun these are perfect treats for friends and family. If you camp with little ones they enjoy making them as much as eating them.